The two most important rooms in your home – hands down – are the kitchen and bathroom. Even the most humble homes around the world typically have the most time and effort dedicated to these two rooms. These are also the two rooms in your home that you are guaranteed to use on a regular basis. There are kitchen and bathroom showrooms that do have some great budget ideas, but these are sometimes hard to find. Replacing your cabinets can instantly refresh your kitchen or bathroom. Upgrading your cabinets can help you to achieve a modern or classic look, while also improving the functionality of your kitchen or bathroom. Additionally, as opposed to refacing, you can significantly improve the condition of your cabinets from the inside out with replacement. Sometimes, a large part of what seems outdated or not up to par about a certain space in our home is simply the fact that it has been the same way for so long. 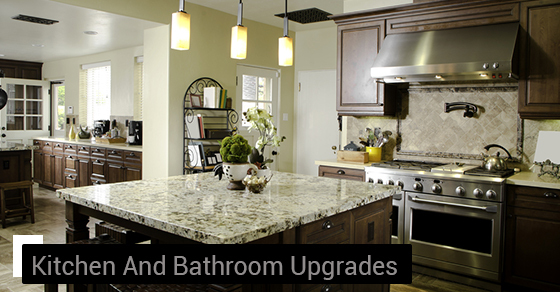 If your kitchen and bathroom needs a small upgrade, consider replacing old or worn out fixtures. This can allow you to enhance the look of your room while also saving on water and utilities. Upgrading your countertops can allow you to achieve a luxurious feel without breaking the bank. New countertops can help you to personalize your home. Even more, upgrading the countertop of a kitchen island or vanity can turn this piece into an attractive accent for your kitchen or bathroom. Updating your countertops is an investment in your home – and choosing the right materials will ensure lasting beauty. Painting is a budget-friendly solution to improve the look of your kitchen or bathroom, and upgrade any room in your home. It’s best to go with a professional when painting your kitchen and bathroom – however, you’ll still retain the freedom to choose the best colour for your space. Upgrading the kitchen and the bathroom is exciting, but the prospect of not having enough money to do it right can take all the fun away. If you are thinking about upgrading and are looking for ways to save some money, opt for smaller upgrades to your cabinets, fixtures, countertops and more. All of the above tips will help you to achieve the home of your dreams on a budget.